do I need one of those brackets to keep the bags off the rear wheel or might I not need that? also, has anyone combined the smaller triangular bags with the regular ones? I'm thinking about maximum storage capability. 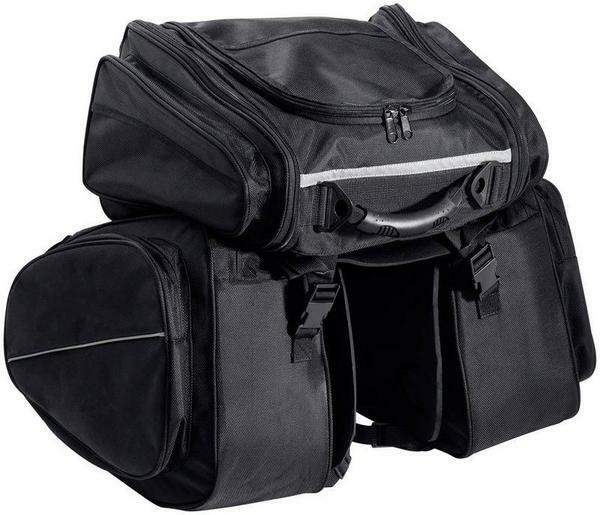 Should I consider saddlebags that are easilly removable like in case you have to leave your bike but you have your saddlebags full with valuables? Re: can anyone recommend a saddlebag setup for my bike? Hi jj, I suppose a lot depends on what style and which manufacturers panniers you use. Many years ago I borrowed some from a friend for a long trip that were the throw over type, they just had a buckle strap underneath that secured them to the bottom of each rear shock. Never needed any stays and they lifted off very easy but I can't for the life of me remember what brand they were. I went all over Wales without a problem (the country, not the swimmy things ). GeorgeSweety wrote: Hi jj, I suppose a lot depends on what style and which manufacturers panniers you use. Many years ago I borrowed some from a friend for a long trip that were the throw over type, they just had a buckle strap underneath that secured them to the bottom of each rear shock. Never needed any stays and they lifted off very easy but I can't for the life of me remember what brand they were. I went all over Wales without a problem (the country, not the swimmy things ). thanks. I'm looking for brown detachable ones you can lock wide enough to hold a gallon of milk. I suppose I can try some out and if they need the "stays" then I'll get them. here they are. check em out. I really like them. but I gotta find a way to secure them under the seat. I have those bags you see in the pics and it works ok on my european CB650. It's from a chain of store called Biltema (car theme) here in Sweden, but i know those saddle bags is made outside Sweden.